Group 11, by modern IUPAC numbering, is a group of chemical elements in the periodic table, consisting of copper (Cu), silver (Ag), and gold (Au). Roentgenium (Rg) is also placed in this group in the periodic table, although no chemical experiments have yet been carried out to confirm that it behaves like the heavier homologue to gold. Group 11 is also known as the coinage metals, due to their former usage. They were most likely the first three elements discovered. Copper, silver, and gold all occur naturally in elemental form. All the elements of the group except roentgenium have been known since prehistoric times, as all of them occur in metallic form in nature and no extraction metallurgy is necessary to produce them. All Group 11 elements are relatively inert, corrosion-resistant metals. Copper and gold are colored. These elements have low electrical resistivity so they are used for wiring. Copper is the cheapest and most widely used. Bond wires for integrated circuits are usually gold. Silver and silver-plated copper wiring are found in some special applications. Copper occurs in its native form in Chile, China, Mexico, Russia and the USA. Various natural ores of copper are: copper pyrites (CuFeS2), cuprite or ruby copper (Cu2O), copper glance (Cu2S), malachite, (Cu(OH)2CuCO3), and azurite (Cu(OH)22CuCO3). Copper pyrite is the principal ore, and yields nearly 76% of the world production of copper. Silver is found in native form, as an alloy with gold (electrum), and in ores containing sulfur, arsenic, antimony or chlorine. Ores include argentite (Ag2S), chlorargyrite (AgCl) which includes horn silver, and pyrargyrite (Ag3SbS3). Silver is extracted using the Parkes process. These metals, especially silver, have unusual properties that make them essential for industrial applications outside of their monetary or decorative value. They are all excellent conductors of electricity. The most conductive of all metals are silver, copper and gold in that order. Silver is also the most thermally conductive element, and the most light reflecting element. Silver also has the unusual property that the tarnish that forms on silver is still highly electrically conductive. Copper is used extensively in electrical wiring and circuitry. Gold contacts are sometimes found in precision equipment for their ability to remain corrosion-free. 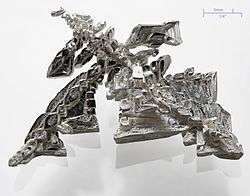 Silver is used widely in mission-critical applications as electrical contacts, and is also used in photography (because silver nitrate reverts to metal on exposure to light), agriculture, medicine, audiophile and scientific applications. Gold, silver, and copper are quite soft metals and so are easily damaged in daily use as coins. Precious metal may also be easily abraded and worn away through use. In their numismatic functions these metals must be alloyed with other metals to afford coins greater durability. The alloying with other metals makes the resulting coins harder, less likely to become deformed and more resistant to wear. Gold coins: Gold coins are typically produced as either 90% gold (e.g. with pre-1933 US coins), or 22 carat (91.66%) gold (e.g. current collectible coins and Krugerrands), with copper and silver making up the remaining weight in each case. Bullion gold coins are being produced with up to 99.999% gold (in the Canadian Gold Maple Leaf series). Silver coins: Silver coins are typically produced as either 90% silver – in the case of pre 1965 US minted coins (which were circulated in many countries), or sterling silver (92.5%) coins for pre-1920 British Commonwealth and other silver coinage, with copper making up the remaining weight in each case. Old European coins were commonly produced with 83.5% silver. Modern silver bullion coins are often produced with purity varying between 99.9% to 99.999%. Copper coins: Copper coins are often of quite high purity, around 97%, and are usually alloyed with small amounts of zinc and tin. Inflation has caused the face value of coins to fall below the hard currency value of the historically used metals. This had led to most modern coins being made of base metals – copper nickel (around 80:20, silver in color) is popular as are nickel-brass (copper (75), nickel (5) and zinc (20), gold in color), manganese-brass (copper, zinc, manganese, and nickel), bronze, or simple plated steel. Copper, although potentially toxic in excessive amounts, is essential for life. Copper is shown to have antimicrobial properties which make it useful for hospital doorknobs to keep diseases from being spread. Eating food in copper containers is known to increase the risk of copper toxicity. Elemental gold and silver have no known toxic effects or biological use, although gold salts can be toxic to liver and kidney tissue. Like copper, silver also has antimicrobial properties. The prolonged use of preparations containing gold or silver can also lead to the accumulation of these metals in body tissue; the results are the irreversible but apparently harmless pigmentation conditions known as chrysiasis and argyria respectively. Due to being short lived and radioactive, roentgenium has no biological use but it is likely extremely harmful due to its radioactivity. ↑ Wright, I. H.; Vesey, C. J. (1986). "Acute poisoning with gold cyanide". Anaesthesia. 41 (79): 936–939. doi:10.1111/j.1365-2044.1986.tb12920.x. PMID 3022615. ↑ Wu, Ming-Ling; Tsai, Wei-Jen; Ger, Jiin; Deng, Jou-Fang; Tsay, Shyh-Haw; Yang, Mo-Hsiung. (2001). "Cholestatic Hepatitis Caused by Acute Gold Potassium Cyanide Poisoning". Clinical toxicology. 39 (7): 739–743. doi:10.1081/CLT-100108516. PMID 11778673.